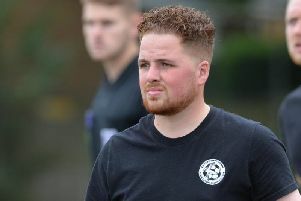 Stuart Spencer has called on his Harborough Town team to finish the season on a high and give themselves a good feeling for the summer. The Bees were, like so many others, washed out at the weekend but will try again on Saturday against one of their closest United Counties League Premier Division rivals Eynesbury. But, while many teams are facing a huge backlog of fixtures because of the weather, Harborough have only six games remaining of their season. And Spencer wants them to use that advantage to finish with a flourish. “Our run-in is not too bad and we’ve got fair gaps between the games – unlike some of the others,” he explained. “We need to make sure we keep the pressure up on the sides around us by keeping on winning. “My job is to squeeze as much out of the players as possible over the last few games and make sure we finish as high as we can. “You do get to the point where next season is in your thinking and, although we’re not looking too far ahead, it’s important how you finish. “If we can win a few games and finish second then everyone goes into the summer with a feelgood factor. “Everyone goes away feeling they’ve made progress and that we’re going in the right direction. “It might only be a point of two difference but if we end up slipping down there could be the seeds of doubt coming in and it makes it a completely different feeling for the summer. “Also, it makes the shopping we want to do easier when players see you finished sixth and not 10th. “If we can take sixth it will be a fantastic year for us. “Seventh or eighth wouldn’t be a failure because progress has already been made from finishing 11th last year. To achieve sixth place Spencer is certain Harborough have to win this weekend. Eynesbury are one place and two points behind them but have three games in hand. Victory at Bowdens Park is, according to Spencer, essential. “There’s no dressing it up,” he added. “It’s a must-win game for us. “If we’re targeting top six then we have to win. “It’s a shame the weekend was a wipeout because I would have fancied us to pick up some points and that would have put more pressure on Eynesbury and the teams around us. “If we lose on Saturday I don’t see us finishing above them so we’re going to be pushing hard. “It was important we got that win over Kirby Muxloe otherwise confidence might have dipped a bit. The Bees are also due to be in action on Tuesday night when they travel to Rothwell Corinthians for the re-arranged derby match. Another game between local rivals that fell foul of the weather was the Easter Monday clash between Lutterworth Town and Lutterworth Athletic. They will both hope to return to action this weekend when they face Harrowby and Raunds respectively.